The process is this. Operating at pressures of 1000 psi+ Koolfog produces micron-sized water droplets that, while evaporating and turning to vapor, remove heat from the air, cooling the surrounding area. The dry fog produced by a Koolfog system reduces outdoor temperatures by as much as 35 degrees Fahrenheit, which makes even 100+ degree days comfortable. Systems are customizable and can be fit to golf clubhouses, golf range stalls, patios, bag drop areas, golf cart maintenance facilities and other employee work areas. Designing a golf course, in particular a golf clubhouse, where golfers want to hang around before and after rounds is vital to a facility’s revenue picture. Members flock to a clubhouse in order to seek relief from the often punishing conditions on the course. The goal of a course owner or designer is to cater to every need of the golfer and to create a memorable experience. A great way to do this is by providing more services, which in turn increases revenue. For example, adding in a full-service restaurant or even a snack bar can increase profits exponentially as guests add meals to their bill or place it on their tab. In simple economic terms, when people remain at a location longer, they are more likely to spend money. Giving members the opportunity to dine on-location means that all revenue from their meals flows back to the club. Extending indoor dining to outdoor patio seating leverages the outdoor al fresco experience and increases usable revenue-producing square footage. However, dining outdoors during hot weather can prove to be uncomfortable. Luckily, misting can effectively and efficiently moderate temperatures without detracting from the experience. Guests don’t have to talk over loud fans or deal with malfunctioning air conditioning. Instead, they dine in comfort while cooling mist gently sprays from above and evaporates before it reaches their heads. Golf facility employees spend much of their time outdoors performing tasks such as tending to golfers, collecting balls on the range, lugging clubs, repairing carts as well manning the starter’s booth. When exposed to warm weather for too long, employees are at risk for heatstroke and heat exhaustion as well as general fatigue. In general, it is a risk for all golf operations and can result in missed revenue or costly medical bills for employers. 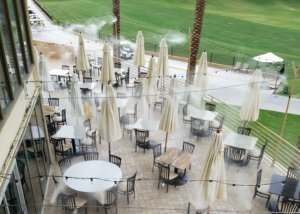 While providing shade is a given, misting can also help mitigate risk by cooling employee environments.